Duxbury DBT is the world's leading braille translation software. DBT supports UEB English and over 140 other languages. Duxbury DBT can produce mathematics and science text into braille. What does our software for braille look like? Most people understand the basics about braille: that it provides a reading medium for blind people, using "cells" made up of raised dots in various patterns instead of the characters used in regular print. But many people do not realize that the cells-for-characters substitutions are not, typically, on a one-for-one basis. The process is especially complicated in languages such as English and French where "grade 2" braille is used, involving "contractions" that are based in part upon pronunciation. 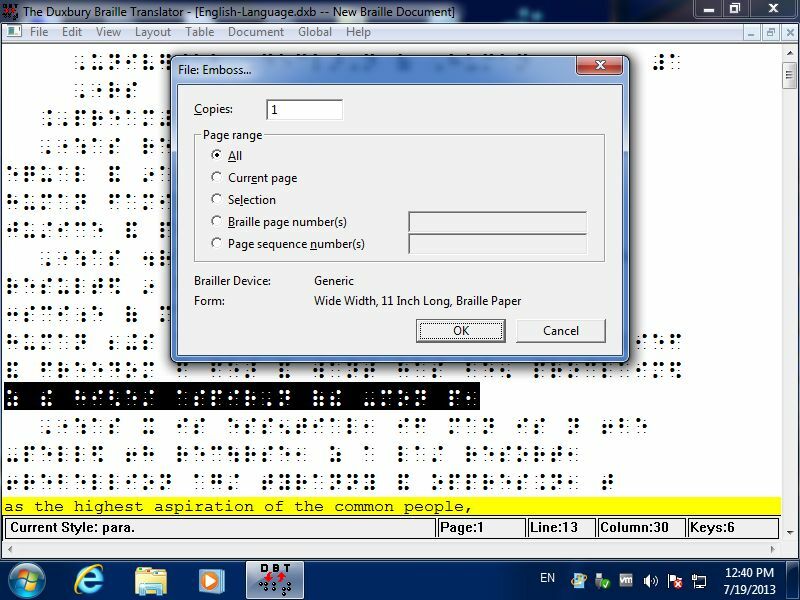 Formatting of braille pages also involves issues beyond those affecting print. DBT provides translation and formatting facilities to automate the process of conversion from regular print to braille (and vice versa), and also provides word-processing facilities for working directly in the braille as well as the print. "Fonts" are used for displaying the braille. Our software is designed for two types--those who don't know braille and those who do. Even if all the braille you know was learned from the previous paragraph, the Duxbury Braille Translator (DBT) will allow you to create highly accurate braille for school books and teaching materials, office memos, bus schedules, personal letters, signs compliant with the Americans with Disabilities Act (ADA) and more. Where you need to be sure of "perfection," we would certainly recommend that you also make use of proofreading (just as you would proofread print books) by a knowledgeable braillist--who may be using DBT as well. That is because DBT is just as important to professional transcribers--for swift conversion to braille from a wide variety of print sources. The current translation table menu includes over 130 different languages plus variations, including contracted braille for most jurisdictions where contracted braille is customarily used. Duxbury DBT can import Microsoft Word 2007/2010/2013/2016 files, as well as Open Office files.